Our team of designers, developers, and writers at Rosemont Media collaborated to produce a highly-advanced, yet user-friendly ophthalmology resource for patients of North Cascade Eye Associates – a Skagit Valley laser eye surgery and vision care practice. Customized with a unique design featuring navigational drop-down menus, the new website provides patients informational access to a comprehensive assortment of optical treatments and procedures including LASIK and cataract surgery, refractive lens exchange, corneal surgery, and more. Additionally, the site highlights causes, symptoms, and potential solutions for a number of prevalent eye conditions, all enhanced by an aesthetically-pleasing layout and several visual aids. 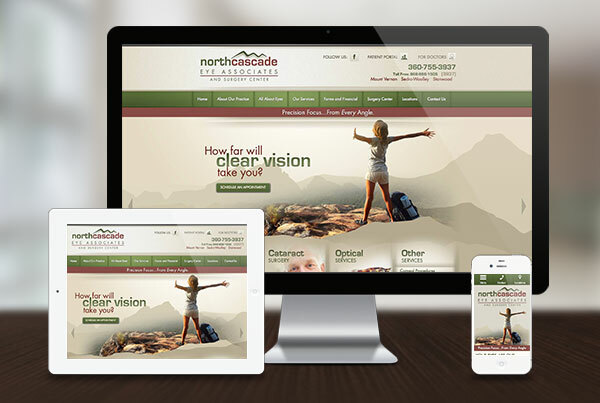 Equipped with the latest SEO and SMO strategies in eye care website design, North Cascade Eye Associates’ site is also optimized to rank competitively on major search engines. Not only can this help increase exposure to current and potential patients, but it also enables the ophthalmology practice to maintain a competitive edge in the field of vision care and laser eye surgery. To take a look at the type of customized website Rosemont Media can design and produce for your practice, visit www.ncascade.com.